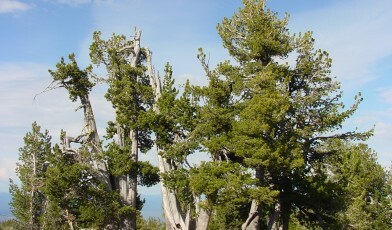 The whitebark pine is native to northwestern United States and southwestern Canada, where it grows in subalpine high elevation mountains marking the tree line. This species protects watersheds, regulates snowmelt runoff and its roots stabilise rocky and poorly developed soils, preventing soil erosion. For these reasons, whitebark pine is considered both a keystone species in these high mountain ecosystems. This species belongs to the group of pines known as the ‘bird pines’, they have wingless seeds and therefore rely on animal dispersal rather than wind. One of its main distributors is the Clark’s nutcracker (Nucifraga columbiana). Clark’s nutcrackers have strong bills that can extract the seeds from their cones, they consume or cache the seeds and those not retrieved from caches by the time the snow melts may germinate and become established as seedlings. The large nutlike seeds of this species are high in fat and protein and are an important food source for many other birds and mammals. Whitebark pine populations have declined over the past 60 years due to two anthropogenic problems, the introduction of white pine blister rust fungus (Cronartium ribicola) and the changes in fire regimes, which are complicated further by increases in the native mountain pine beetle (Dendroctonus ponderosae) populations. 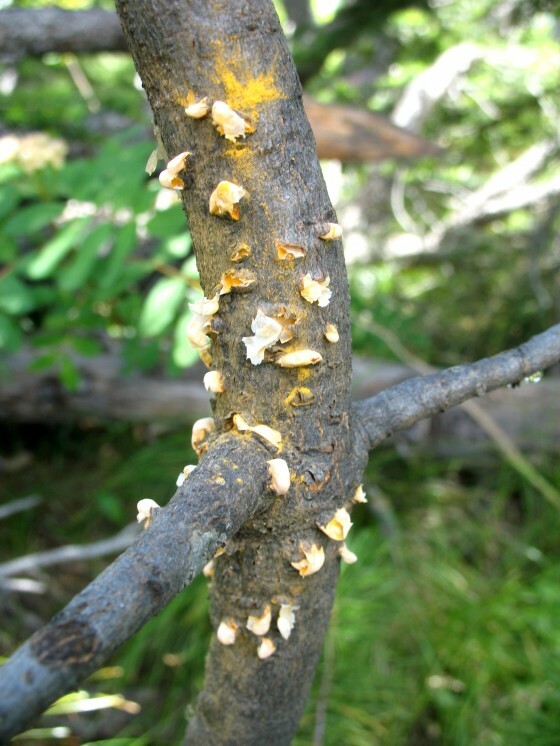 White pine blister rust was introduced into Canada from Europe in the early 1900s, it has spread nearly rangewide in whitebark pine forests, causing dieback and mortality. There is currently no way to stop the spread and effects of this rust fungus, but a small number of trees in most populations show some resistance to the disease. More recently, mortality of Whitebark pine can be attributed to the native insect pest, the mountain pine beetle. The impacts of warming temperatures and decreased precipitation due to climate change is likely to result in increased mountain pine beetle activity as well as declines in suitable habitat for Whitebark pine regeneration, an increase in the number, intensity and extent of wildlfires, and an increase in bluster rust fungus. In addition to mortality due to wildfires, 60 years of fire suppression has led to Whitebark pine stands being replaced by more shade-tolerant, fire intolerant species such as Engelmann spruce, Mountain hemlock and Lodgepole pine. Conservation measures are in place. 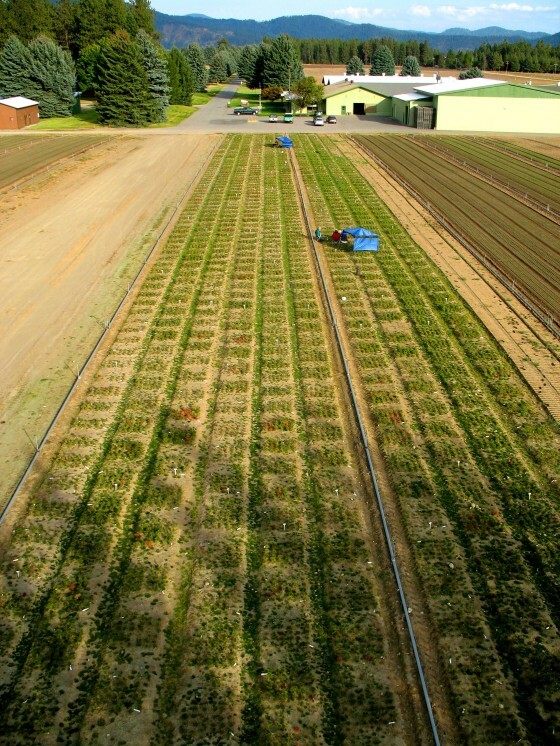 Genetic programs have been set up to identify, harness and deploy rust resistant Whitebark Pine and over 1,500 hectares have been planted with rust resistant seedlings ex situ. Prescribed fire is being used for site preparation for artificial regeneration of rust resistant seedlings and to enhance natural regeneration. Verbenone, an anti-aggregate pheromone, is being used to protect trees against damage from the mountain pine beetle. More research is being initiated into the affects of white pine blister rust fungus and mountain pine beetle on the Clark’s nutcrackers in regard to seed dispersal. Initial research indicates that when the Whitebark pine trees decline in number, a point is reached where Clark’s nutcrackers will not visit a site thereby reducing the natural regeneration of Whitebark pine.